Recently I’ve had a hard time getting Emma to nap. She refuses to nap even though she is clearly tired and then I have 1-3 hours of screaming and whining because she is so tired. Normally I can tell when she’s having a growth spurt as she naps like a dream. I can put her down with a bottle of milk and within 15 minutes she is fast asleep and will sleep for between an hour and a half to two hours. Twice a day! I’m lucky if she has 1 half hour nap a day. It’s exhausting. Especially as if we go out (in the hopes she falls asleep whilst we are out) she usually does fall asleep. About 5-10 minutes just before we get home. It’s not like I can even just leave her in her pushchair as we live on the 2nd floor and there is no elevator! Which is exactly what happened yesterday. At 4pm. 3 and 1/2 hours before her bedtime. I managed to get her upstairs and into her cot, and then just before 5pm I decided to wake her. I’ve always been told you never ever wake a sleeping baby. Why? Because kids who are tired, are grumpy and whiny little buggers!! Being at home on sick leave has meant that I get to spent a lot of time with Emma. The tears break my heart and I kiss them away, but the giggles? They make my heart soar and remind me of how important I am to her. It’s funny. When you’re pregnant and then when you become a mother, you discover who your friends really are. The moment you tell people you are pregnant, there’s a hubbub of congratulations and excitement. Then people seem to think you’re fragile and things change. Beforehand you’d get invited to nights out. Weekends away. Dinners in semi-fancy restaurants. It’s as if being pregnant means you’re no longer allowed to do such things. Instead whilst your friends go out and have fun, not inviting you (mainly because they assume you won’t want to go, they assume you’re feeling sick or tired) you troll Internet pregnancy and parenting boards looking for people in the same situation as you so that you can bond. So for almost 9 months, you slowly begin to lose touch with those friends. You see Facebook statuses, tweets, photos of their “adventures”. You wonder why you weren’t invited. You feel a bit upset, hormones are raging, you have a cry and then you feel angry. Then? You stop caring. At least for a little while. Then d-day comes and you have your baby. You make your birth announcement and all of a sudden everyone comes out of the woodwork. You get lots of congratulations and excitement, lots of messages asking when people can come and visit. People wanting to come and hold your new baby. The same people who only weeks/months before simply stopped involving you in their social life/circles. Who only rarely sent you a message to see how you were. Who very rarely responded to your messages. The first few weeks of having your new baby is a flurry of visitors. People invite themselves to your home for new baby cuddles. Then it tails off again. As the weeks go by, you get less visitors, less messages, less phone calls. These same people carry on with their lives. You carry on with yours, getting to grips with a new baby. Again, you don’t get invites to go to the pub, out for a meal. Instead you see photos from nights out, Facebook statuses, tweets. When you jokingly say “where was my invite then?” People uhm and ahh, unsure of what to say and then finally come out with “I didn’t think you be able to because of the baby”. You don’t get invited because people assume you are too tired/ can’t go because you have a baby now/ don’t want to go. As if having a baby, being a mother means that you can now no longer attend social functions. As if being a mother suddenly means you are no longer an actual person. With feelings. Well, here’s the low down, from a new mama. Just because I am now someone’s mother and have the responsibility for a child, doesn’t mean I am not a person, who on occasion needs some adult conversation, interaction and occasionally a glass of wine! Don’t stop inviting me out because you think I can’t/don’t want to go. Don’t assume. You know, your assumption may be correct. I may be too tired and not want to go. I may not have a baby sitter and so cannot go. But I’d like to be asked. To be invited, instead of feeling excluded. Remember that. Remember to continue to treat your friend like a friend after she announces her pregnancy and has a baby. Otherwise you may find that one day she won’t be your friend anymore. Eventually she will stop trying, will decide to stop asking herself what she did to be treated the way she was, and she will just walk away. It’s amazing how much she’s grown. 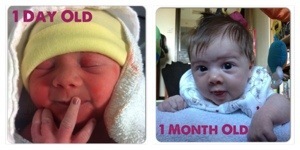 Whilst I don’t want her to grow up too fast, I cannot wait to see how she grows and changes over the next few months. Towards the end of my pregnancy, a few of the ladies I’d met started a conversation about baby wearing and the benefits. Babies feel comforted by being close to you, it’s calming for them. You have your hands free to be able to eat/drink/read a book/do light housework etc. Promotes healthy babies, being so close to mum or dad helps them to regulate breathing and physical responses. So I was delighted when my parents got me a Moby Wrap for my birthday. It’s taken some getting used to for both myself and Emma. Putting it on was easy (following the instructions) but getting Emma into the sling and settled, as well as ensuring I was comfortable and felt that Emma was secure, was another matter!! It’s taken several attempts, but today we cracked it. 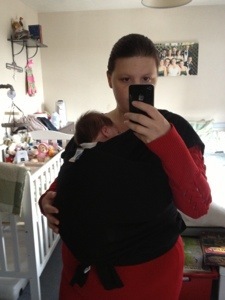 I put the sling on, put Emma in it, and after 2 adjustments, Emma was content and fast asleep within 5 minutes! this post is not a sponsored or paid post, just simply my own views on a product I wanted to try out. This post is not endorsed by Moby Wrap. I am however happy to review baby products, so if you are a brand who wants to send me baby stuff in return for an honest review then please get in touch.